We all have busy lives, even those of us who love to cook. When you don't have time to stay in the kitchen and make flan from scratch, open a box and about 10 minutes later the flan is in ramekins and is cooling on the counter. Twenty minutes later, it's safely chilling in the refrigerator and you can be off doing something else. Substitute half-and-half for half of the milk. This will give the flan a richer flavor and creamier texture. Substitute espresso coffee for half of the milk for deep coffee flavor. Garnish with whole coffee beans and a dollop of whipped cream. Replace the milk with equal parts of half-and-half and coconut milk for a richer texture and coconut flavor. Garnish with toasted shredded coconut on top just before serving. To ensure coconut flavor, use full-fat coconut milk. "Coconut cream" is thicker and richer, with more coconut flavor, but because it has added sugar it may make the flan too sweet. Melt 2 to 3 ounces of bittersweet chocolate in a small saucepan or in the microwave, then stir in some of the milk-flan mixture to the chocolate to thin it. Slowly add the melted chocolate mixture into the milk-flan mixture, while stirring. If necessary, use a stick blender or electric mixer to thoroughly blend. Substitute half of the milk with half-and-half and add 1/2 cup (4 ounces) almond paste for a rich almond flavor. Garnish with sliced almonds. Add a teaspoon of finely chopped dried fruits, like figs and dates, or chopped nuts such as almonds or walnuts to each ramekin after pouring batter. 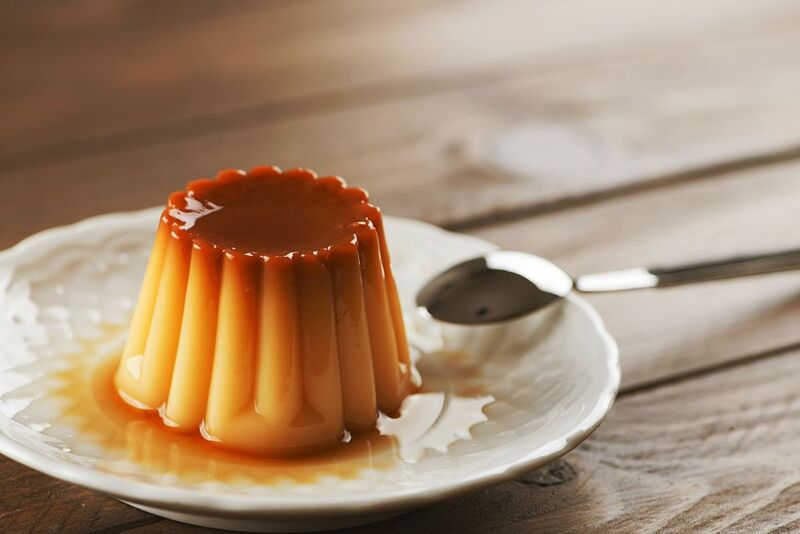 Add two to three tablespoons of your favorite Spanish liqueur or brandy to the milk-flan before it boils. Instructions on most flan mixes will state to bring the milk mixture to a boil briefly, so adding the alcohol before it boils will allow some of the alcohol to evaporate before baking. Spanish sherry brandy, rum, or Liquor 43 are a few possibilities. If you are preparing a no-bake flan from a box, and want to use fresh fruit, we recommend you wait until the flan is ready to serve. Arrange the fruit on top of the individual servings, or on the side to add color and fresh fruit flavor. Adding some fresh fruit to the mix may cause the flan not to set properly.